​Although Collie Rescue do not get involved with dogs from abroad or Southern Ireland until they are on these shores, there are sympathetic dog lovers out there who do help get these dogs to safety. Rescue can then step in to help with the re-homing. There have been numerous requests on Facebook for financial help to pay for travel, veterinary fees, vaccinations and Pet Passports when dogs have been found and rescued abroad and a big THANK YOU goes to all those who have contributed to our cause, on more than one occasion, through cash donations and organising tombola’s and raffles. HAPPY HARRY the beautiful "swan"
In early March this year, Foreign Dog Rescue once again found themselves asking for donations via Facebook for NICKO. 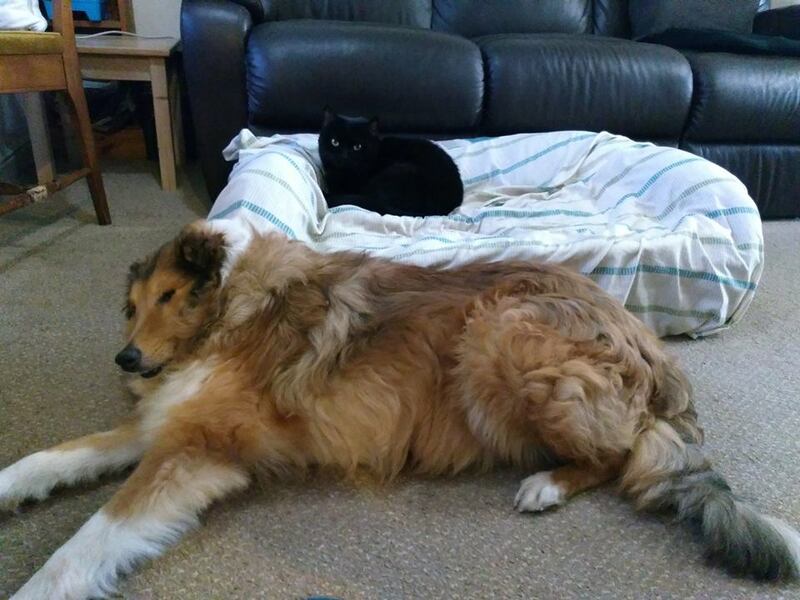 Nearly £1,000 was raised within days, and so we were able to secure his safety, get him well again and pay for his travel to the UK where Collie Rescue found him the most fantastic home. Here is his story, taken from Facebook communications between Lesley Bassett and Mina, his foster mother in Greece. 2nd March, 2018 - Lesley Bassett. I received information from several people about a collie in Greece. I have to say I was stunned, never before have I seen a dog in such terrible condition and I had no idea how or if we could help. After many messages over several days I finally made contact with someone who was able to assist. The owner of this poor dog passed away a couple of months ago and he'd been left on the streets fending for himself. We have managed to arrange a foster carer and he has been taken to Athens to be treated by a vet. 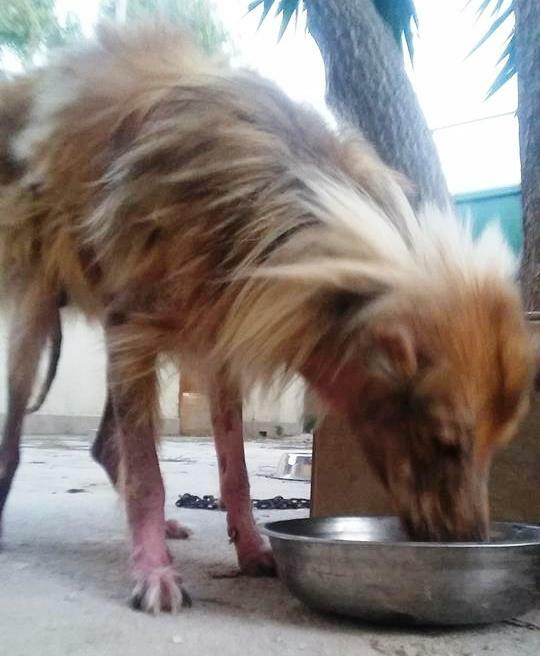 He's dehydrated and anaemic, his liver and kidneys are ok and surprisingly has tested negative for Mange. More tests have been performed and we await the results, but in the meantime he is safe and receiving medication. It has been agreed that if a suitable home cannot be found locally he will be signed over to Collie Rescue when he is fit enough to travel to the U.K. The foster carer has named him Nicko. A couple of local ladies are trying to help and I've been in contact with them over the past 24 hours. They've managed to find "a mistress to host him" (foster carer) and now they're trying to sort out transport to a vet, none of them have a car. It's all a bit tenuous but he's in such poor condition I'm afraid I couldn't do nothing. Waiting now until I have a definite point of contact with a foster home and an indication from the vet as to what he needs. My concern is Leishmaniasis, if positive we'll need to know if it's cutaneous or visceral. One step at a time but at least it's looking like someone is going to take responsibility for him now. His tests have revealed mild Babezia, Erlicha and Leishmaniasis (all Mediterranean diseases), so he is receiving the necessary medications. The skin scrapings also show a mild fungal infection so he'll be given medicated baths to help. He is being kept in quarantine at the vets until we can be sure he isn't harbouring anything infectious. Nicko’s bloods came back today and liver and kidney function are fine. The test for Leishmaniasis came back as 1/100, so he's starting a course of Zylapour tomorrow just in case. He's also starting a course of Vibramycin (Doxycycline) for Erlichia. Three of the skin scrapings surprisingly came back negative for mange, so they'll run thyroid tests tomorrow and check for an allergic dermatitis. His results for Babesia will be back tomorrow, so fingers crossed for a negative on that one too. He's also full of worms which was no great surprise. Vet suspects he may be an older dog, but hard to tell because he's in such bad shape. I think that makes it more important he has a safe and happy retirement. 9/3/18 - Lesley Bassett - This evening I have received some more pictures and an update of our Greek friend Niko. He still has a long way to go but I hope you'll all agree he is looking much happier and his eyes are brighter now. His skin is being treated with special baths, but unfortunately the medication for the Babezia caused diarrhoea and he stopped eating so the vet stopped these pills and he was OK again, this is going to be a long journey for him but at least he is in safe hands now. He's also being fed a premium diet to help build his condition. Our collie boy "Niko" is doing better. As you can see, he has a very good appetite. He has taken antibiotics for Erlichia for 15 days (of the 30-day-treatment) and he is a totally different dog. He gets out in the garden and he barks if he hears a stray dog passing by. He has become self-confident and he "asks" from the vet to caress him and show him affection. He is clearly a people orientated dog, playful and carefree. I am sure that when his fur becomes as it should be, the "ugly duck" will become a beautiful "swan" ready to be adopted. 16/3/18 - Mina I collected "Niko" from the vet and took him for a warm bath with Betadin scrub. Twice he jumped out of the bath tub but I managed to massage his body with the medicine. Then I took him back to the vet's where I used my scissors and cut as much hair as I could. Next bath will be easier. Niko loves the vet. I think he believes the vet has adopted him. The vet began again the medicine Antirobe for the Babezia. And this time Niko didn't have stomach upsets which is good. I wish so much to get well and have his lovely collie fur back again. I will give him a bath again on Monday or Tuesday with the medicine. My back is killing me again, but Niko must get well. 23/3/18 - Mina Today I gave Niko one more bath. It is easier now that I have cut his hair. He doesn't like to get into the bath tub but when I start to massage him with the special shampoo, he enjoys it. My back hurts a lot but I am happy. His skin is softer and smoother. 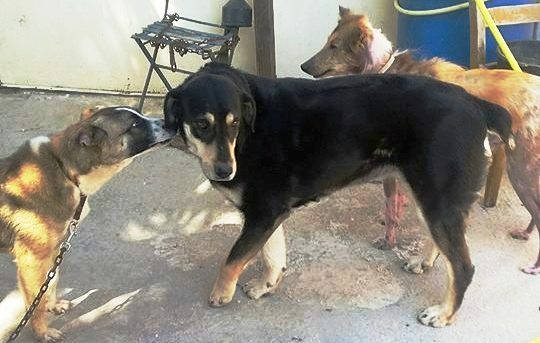 His treatment is well underway, and he is full of energy and gets along with both female and male dogs as you see in the photo. The vet told me today that we will not recognise Niko after two months. I can't wait to see that and nothing would make me happier than to bring him to the UK where I hope he will find a loving family. I have tested him with my cats in our house, he didn't even notice them. Get well soon baby. We love you. HARRY'S STORY, IN HIS OWN WORDS ! Mateo was found in Spain in August, 2017 and placed in the local Shelter. He came to the attention of Lesley Bassett via her contacts over there and things were put into motion to get him into a foster home, sort out his health issues and then bring him over to the UK for re-homing. 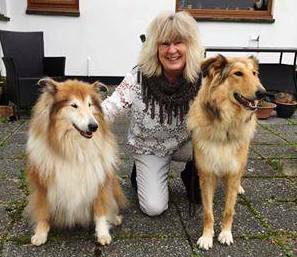 Foreign Dog Rescue is operated by Samantha Hale and Annette Rebmann, along with a very experienced Lesley. Collie Rescue only get involved once in this country. An appeal was put onto Rescue Facebook page for funds to help him. We achieved this within a matter of days and Mateo was on his way to recovery. See below for his experiences from personal messages Lesley sent to Sam and Annette. This will also give an insight into how things work for foreign dogs who we bring over to the UK for re-homing and the stresses involved in some of these rescues. The end results of happy, healthy dogs in loving homes are sometimes forgotten when we are in the middle of a crisis, like Mateo experienced along the way. But all was well that ended well, and he is now in his loving, forever home. “Hi ladies, the Spanish Collie has been named Mateo and the lady trying to help is called Mayte. She visited him this morning in the shelter and found him to be thin, dirty and scared. He needs his shots 2 days before he can enter the pension (kennels) so she is arranging this and hopefully has a friend lined up who can take him for a few days. She explained she has a 4 year old and toddler twins and is a single mum so apologises for not being able to foster him herself. Initial costs will be €50 release fee, €30 for the shots and €80 for a month’s pension so this will be covered by the funds Annette sent me. Mayte has given him flea and worm treatment today. Quick update ..... Mateo has been to the groomers, he looks so much happier now he's out of the shelter and he must feel a whole lot better after his groom. Mayte has grown quite attracted to him and has asked if she can keep in touch with his new owners. One last thing, he's been diagnosed with Ehrlichia so needs a course of antibiotics for a month then he'll be fine, it's not contagious and is transmitted by ticks so shouldn't affect his travel arrangements. He's booked to travel on 22 September, but as yet I don't have the full schedule nor where he comes in to the UK . Travel costs have been covered by donations from very generous “doggy” people. I'm in the middle of the mother of all screw ups with Mateo. The transport he was travelling with has been impounded in Folkestone! Background is the van the company were using broke down last week so they've hired a replacement which wasn't licensed to travel animals. Someone has shopped them and when they arrived in the U.K. last night the van was seized and all animals removed to a DEFRA approved kennel facility (I suspect they're in kennels at the port). We know they're not with the approved kennels in either Deal or North Weald and it doesn't make sense for them to be moved off site. The transport company had a robbery last week where their laptops and other goods were stolen. I know this to be true because they posted this info last week as an excuse for loss of my details. Because today is Sunday I suspect they won't be able to sort this mess out until the morning, Mateo was scheduled to be arriving with me at 21.30. I have offered to drive to Folkestone with my ID to claim him if this will help. At the moment they're off line a lot because they're concentrating efforts on sorting this mess out. Something has been mentioned about them leaving the paperwork on the old van but this hasn't been confirmed and I'm trying hard not to buy into all the FB rumours and speculation at this stage. I am beyond furious at the complete incompetence this company have shown from start to finish. There have been many other smaller glitches along the way I haven't bothered troubling you both with. I'm sure if Mateo is with DEFRA he is being well cared for and my only concern is getting him to me as soon as possible. I have never used this company before and needless to say will never do so again. I'll keep all posted but at this stage I will not mention to the adopters as I do not want to cause them worry before their holiday. If this is not resolved by tomorrow I will be onto DEFRA and the Folkestone port myself even if it means going down there. HONEY was found earlier this year in Greece having been abandoned and living wild under a bridge. She was rescued and placed in a temporary foster home. 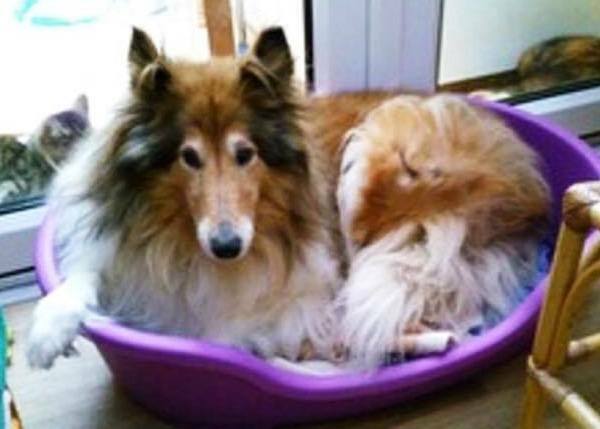 Although not a full Rough Collie (we think she has some Lurcher in her somewhere), Lesley, from Foreign Dog Rescue was contacted and the wheels were put in motion to get her to the U.K. for re-homing. A Facebook appeal was put out and with the help of donations, Honey’s health issues were sorted and all her travel paperwork and transport was organised. She is now in a forever home in Cornwall. At only ten months of age, HENRY was surrendered to a pound in Southern Ireland by his owners due to him being blind or partially sighted and with a disability of his back legs. If left in the pound he would have been put to sleep due to his condition. 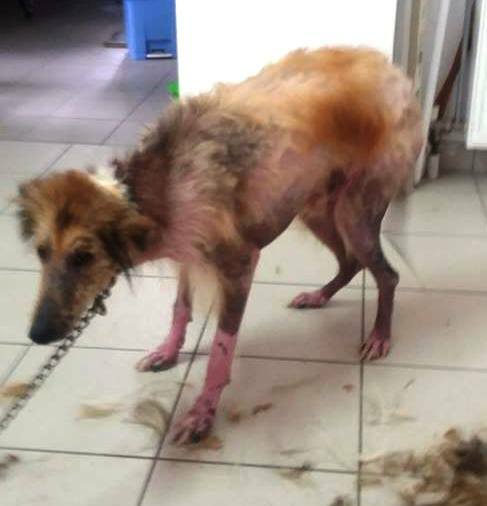 He was saved by a group of people who club together to save these foreign dogs and fundraising was put in place to pay for his veterinary bills in Ireland, pet passport and travel to our shores where Collie Rescue found him a perfect home. Henry arrived here earlier this year and has settled very well into his new home. He has had numerous veterinary appointments, and the conclusion is that he is blind in one eye and partially sighted in the other. At first it was thought that operations on his legs would help him walk better, but as time went on the decision was not to operate, but to use acupuncture and physiotherapy. 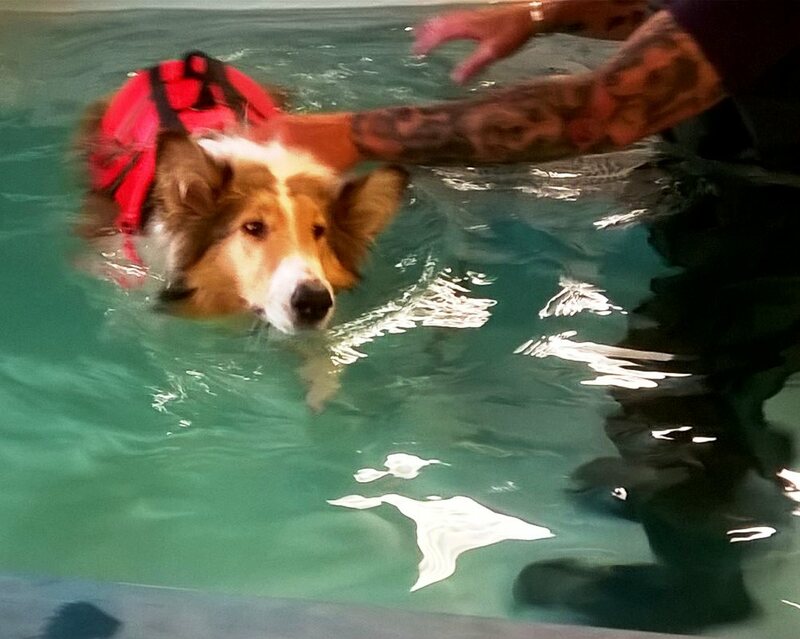 Recently he has been having hydro-therapy. His back legs and knees are too damaged and he also has spinal and right shoulder damage. Nothing can be done for his sight sadly and there is a possibility that he could eventually become totally blind. 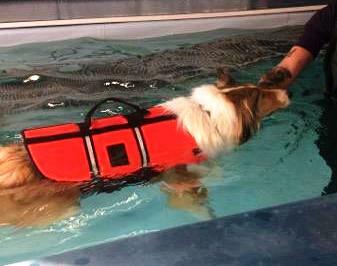 He is having acupuncture and physiotherapy regularly and recently started on hydro-therapy which seems to be helping him a lot. He has more movement in his legs and toes and once he has rested, appears to be able to walk much better. Earlier this year his family said ... We have changed vets, been to see Dr Taylor today. Henry will not be having any surgery as there is just too much hip, knee, hocks, tibular and fibular surgery needed ...the list goes on. It is too much for him with no guarantee on the outcome. He will have physiotherapy and acupuncture. He is such a brave boy. Now on medication for pain and he will be reviewed every 3 months. He is happy and copes well. He is loved and has a happy home ... Henry manages to enjoy himself daily, playing football and helping in the garden by mainly digging up the lawn !! He goes for short walks daily to keep him mobilised and thoroughly enjoys these trips out. With all his disabilities Henry is a very happy boy who takes each day in his stride. Corby, previously named Reina, travelled from Bosnia with Phoenix. She was advertised on their equivalent of our “Gumtree”, being offered for sale at around 60 euro. A vet check found she was in pretty good health, apart from some damage to her lower tail which the vets amputated to stop infection from spreading and was rather thin, so a good diet was organised for her and she was placed in a boarding kennels to await her vaccinations and Pet Passport ready for travel to the UK, which happened in November, 2016. Here is an update from the family who took her on. Reina came over from Bosnia in November last year and joined our family. When she came she didn't have much weight on her and no fur on her tail due to it being amputated. She now has a lovely little tail with fur and has put weight on. We decided to change her name to Corby and she responded to this with ease. Corby loves her walks with our sons and loves playing with her toys . She sleeps on my sons bed. She has come on so much since November, it's like she's always been here. Phoenix was found at deaths door by the side of the road in Sarijavo, Bosnia at the end of May, 2016 and was rescued just in time. She was taken to the vets for emergency treatment ... fluids, tick removal - over 80 ticks were removed from her frail body, and antibiotics. 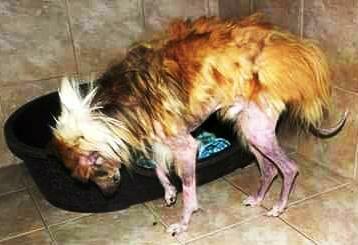 She was painfully thin and had been used for breeding and then dumped !! She was thought to be 3 or 4 years of age. She was moved to a boarding kennels (known as a Pension) and did very well. 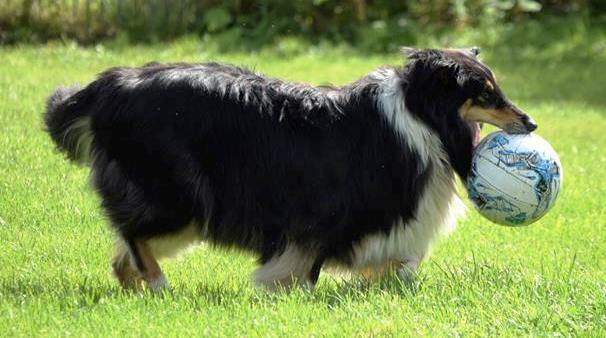 She had a “virtual adopter” here in England who paid all her vet bills and kennel charges until she was ready to come over to the U.K. to be re-homed by Collie Rescue (Rough and Smooth) UK . She eventually travelled to England in November, 2016 and was re-homed directly to her new family in Loughborough. Her story is taken up here by Karon, who is Phoenix’s new mum. ​"I’d waited a long time for Phoenix, so much so that I was beginning to think I would have to give up on a rescued dog and look for a puppy. The problem was I have 4 children, currently ranging from 6-13 and for obvious reasons many rescue dogs simple aren’t compatible with our family. Then I heard about Phoenix, and to be honest I didn’t dare hope she would be a good match. The fact that she was in another country just seemed astounding to myself and my sons and everybody got a bit excited. We arranged that she could come to us early November, bypassing the November 5th fireworks which she apparently was scared of. I was kindly sent the transport details for the truck she was on and this meant that I could follow her progress across Europe with GPS on board. This turned quickly from a bit of a joke into something that lots of people enjoyed, and I ended up posting regularly on Facebook with a description of where she was and a photograph from Google Maps of the area, if possible. I learned more about mainland Europe in those 24 hours than I ever did at school! If anybody in the future rescues a dog from another country I really recommend following their travels. My first impressions on meeting Phoenix were that she was scared but desperate to please. She wasn’t scared of people but was wary of the situation she was in, understandably. She walked into my house and was immediately scared of my laminate floor, a surface she is still wary of today, but trimming her pad fur and some paw wax have helped. She mostly stays in the back of the house which is tiled, near my guinea pigs whom she adores. We had a scary moment on the second day of ownership, as I had taken her for a walk and due to her reluctance to cross my laminate floor I’d left her standing on my doormat while I took my coat off and went to get her a dog treat to encourage her to cross the floor in her own time. At that moment my parents opened the front door and she bolted! I went out after her and calmly called her back (even though my heart was hammering! Annette had told me very clearly never to let her run out of the front door! ), but she came straight back to me and at that moment I knew everything was going to be okay. She’s settled in well, taking to my children at first meeting. When they ran up to say hello, she wasn’t fazed at all, just calmly fetched her ball, dropped it at their feet and off they went playing happily as though they had known each other for ages. I can even let her off the lead for a run and she comes straight back, something I did not expect at all in a rescued dog. Whoever had her in Bosnia, looked after her well I think, she is house trained beautifully, lead trained, and very responsive. Of course it would not be fair to make out that she is some sort of angel of a dog (she is!) because she has dug a couple of holes in my garden, and she does insist on rolling on the grass every single time we go out for a walk (five times this morning, a new record!). She also likes to run about and then run straight at you and jump up, which we are currently working on to stop. She prefers to drink rain water any day than drink out of her water bowl. She also likes to stop and collect her pee mails every few metres if she can, and she likes to say hello to every single dog on a walk whether they want to or not. She is also convinced that squirrels are evil! She is the best behaved of all the collies I’ve had, and I trained the previous two, so that’s saying something! Since my last update Phoenix has had her first seaside holiday. She loved going on the beach and wasn’t at all phased by the sand or the sea. She didn’t like going to the toilet on it though, as she doesn’t like people looking at her, so she was always trying to hide behind breakers. Favourite memories from the holiday were my sons running off up the beach and Phoenix going into “mum mode” to round them up and bring them back to me, and my son Danny burying himself in the sand, which resulted in a frantic doggie digging him out! The funniest moment was when we went to a deserted Castle with a proper moat full of water. The moat was almost entirely covered in pond weed making it look a bit like a grassy field. My son Daniel said to me “Wouldn’t it be funny if Phoenix thought the water was grass and tried to walk on it?” I turned around at that second to look for her just as she did just as Danny predicted and with a huge splash ended up in the water! She got out easily enough though even if she was a bit disgusted by it all! When we got home, Phoenix started wetting in the night, which wasn’t at all like her. I thought initially the change of scenery with the holiday might have upset her, together with the change in routine because she had been doing school runs with me twice a day and that had changed to longer walks at different times of day so the routine had gone. She didn’t seem distressed at all though. Eventually, after trying various things to try to break her of it, I took her to the vets who examined her and said she looked well but suggested a urine test. This revealed that she had an infection and struvite crystals in her urine. She has just today finished her course of antibiotics for this, she has a few days more of anti inflammatory medicine and is on a special veterinary urinary dog food. I have to get her urine retested in the next few days to find out if the problem has cleared itself up or if she is on the special food for life to stop the crystals from reforming. I am pleased to report that from the first dose of antibiotics the weeing in the night stopped and hasn’t returned, and Phoenix is now much more loving towards me so our bond has been strengthened through the experience, so overall something positive has come out of it . As an ex street dog she obviously hides feeling poorly, but I will be expecting that if anything happens again . ​Over the summer Phoenix also went to her second Collie Chaos and if you were there she probably came up to say hello and see if you had any treats she could beg from you! She loves seeing all the other collies and getting lots of fusses. 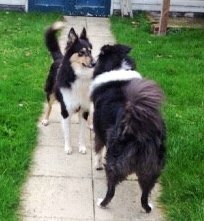 I love seeing all the different types of collies all together and meeting up with friends old and new. Phoenix entered a few of the fun dog show classes with my son Danny and managed to bring home the rosette for best footballer! It wasn’t a big surprise as she is an absolute nuisance for wanting to play football, even charging into groups of children playing football and intercepting the ball! She is very lucky that my four boys will play football with her whenever she wants to! Danny was scared of dogs before we had Phoenix, so I was very proud that he was brave enough to take her into the classes. Phoenix showed off her dribbling and heading skills and luckily the ball was tough enough that she couldn’t burst it! The poor space hopper wasn’t quite so lucky though ! I can’t quite believe that Phoenix has been part of our family now for nearly a year. She now happily comes in the living room and will lie there for a short time, whereas even a few months ago she only stayed in the back of the house. 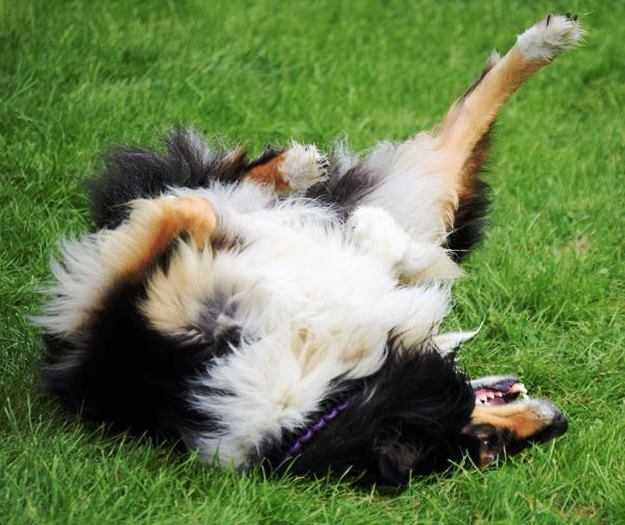 She’s still a monkey for rolling in grass at every opportunity and if you see the pictures from Collie Chaos, any pictures of a dog on its back will be her! She’s a very much loved member of our family and we are very pleased and proud of her . Flossie came over from Southern Ireland in August 2016 after being financed by a lady called Lesley who is involved with most of the foreign dogs that come to this country for re-homing. She was a surrender rather than a stray. The family had young children and were no longer able to keep her although we never actually got the full story. The impression we got was the wife didn’t want her, but the husband did. Flossie was shy and un-socialised, but Liz, her new “mum” has been great with her. She now lives in Exeter and accompanies Liz pretty much everywhere.